My most widely read post ever has been Dr. Stuart Shanker and Self-Regulation, which is a summary of Dr. Stuart Shanker’s presentation at the November 2010, BCSSA Fall Conference. It was around this time Shanker started to become known in the BC educational community, because of his work in Ontario and from a few presentations he had made on self-regulation in British Columbia. Since then, he has become an extremely influential figure in early learning, as well as on how we look at students with unique needs, and at student support service models throughout our province. And, last month, he shared centre stage with the Honourable George Abbott, Minister of Education, as they discussed ‘the way forward’ in education to board chairs, superintendents, secretary-treasurers and principals. So, what is the message he is sharing? Shanker argues that approximately 70 per cent of kids cannot wait to eat the marshmallow, and that longitudinal studies done on the kids who do wait show they do perform better in life, have better entrance scores to university, better relationship success, and higher standings on a number of other factors (Shanker does acknowledge there has been some debate about this test and what it represents — but maintains that recent data has supported the original findings). Using the marshmallow test as a backdrop, Shanker argues there is research to show that we can actually improve a child’s ability to self-regulate — that is, to manage stress (environmental, physiological, emotional, cognitive, and social) and this ability is particularly important for students with special needs, because these students have too many stresses to control themselves and not enough energy to self-regulate. In the classroom, Shanker says we need to support children so they are not overstimulated or overstressed. This involves giving students the ability to learn self-regulatory skills so that they can self-regulate when stressed, and this can also include adapting to their learning environment with more opportunities for physical activity (see Spark for more information on this). He ended with something I have heard him say many times before . . . . there is “no such thing as a bad, stupid or lazy kid.” These are powerful words with a powerful message. Over the last 18 months, Shanker’s work has become hugely influential in West Vancouver and around British Columbia. There are three key areas of energy that I often speak on currently happening in West Vancouver: digital literacy, inquiry and self-regulation, although, I did not know what self-regulation was just two years ago. Shanker’s work is exciting, and it offers a new lens on the struggle children have growing up. We are looking forward at thoughtful research on the success of self-regulation initiatives to better meet the needs of our most needy learners, as well as the needs of all learners. I often speak about the need for face-to-face interactions in our changing education system and increasingly digital world. I have also cautioned about the proliferation of fully online courses, (in this district or elsewhere) as being an important move forward. There is great power in digital learning to support, supplement, and sometimes even replace face-to-face learning, but K-12 should remain, primarily, a face-to-face enterprise as we prepare our future generations. Two weeks ago, I had a great reminder of the power of face-to-face. 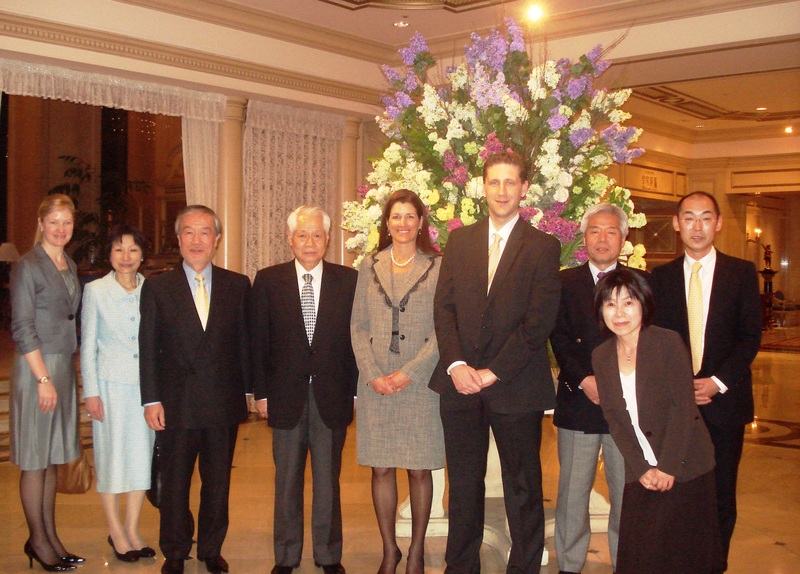 For more than 20 years the West Vancouver School District has had a relationship with Mejiro Kenshin Junior and Senior High School in Tokyo, Japan. This has been a very enriching relationship for all involved. Each summer, Mejiro sends a large group of students to West Vancouver to study English and engage in cultural experiences, and we have teacher and student exchanges on a regular basis. Also, over time, those most closely involved with the relationship have retired. Each year, there have been fewer people to explain the history and importance of the relationship. I have heard the stories about the relationship, read briefs and have spoken to a number of teachers and students who have travelled to Mejiro, but I did not truly appreciate this relationship and all of its importance until I had spent some face-to-face time with our friends in Japan. Along with our Board Chair, Cindy Dekker, we were kindly invited to Mejiro, as their guests, to discuss our relationship, renew our bonds of friendship, and build new partnerships. Being the start of the Japanese school year, I had the opportunity to speak at the school’s Opening Day, and to all the new parents at Mejiro. I spoke of how technology will connect our world all the more. I also spoke about the power of relationships –- the one true strength as a social tool in reinforcing and deepening the relationships we make in the face-to-face world. After a whirlwind, three-day trip, I left committed to the continuity and strength of our relationship — and, I wonder if I would have felt the same way if we hadn’t connected in person. We also made some commitments for the future that will see Mejiro assisting with Japanese instruction in our community, and will have our teachers assisting with English instruction at their institution. I also left with relationships that, when I connect with future emails, will mean something more than just an electronic connection. So for us, as well as for our kids, it is one thing to explore and learn in the digital space, or understand things in theory, but real world learning and real world relationships will still require face-to-face interactions. If asked, most people would agree they could do well with more flexibility in their life — this is also true in the education field, and almost all education reform movements include a call for greater flexibility. Of course, this can mean something very different from one person to the next. For me, flexibility is about giving more choice and ownership. 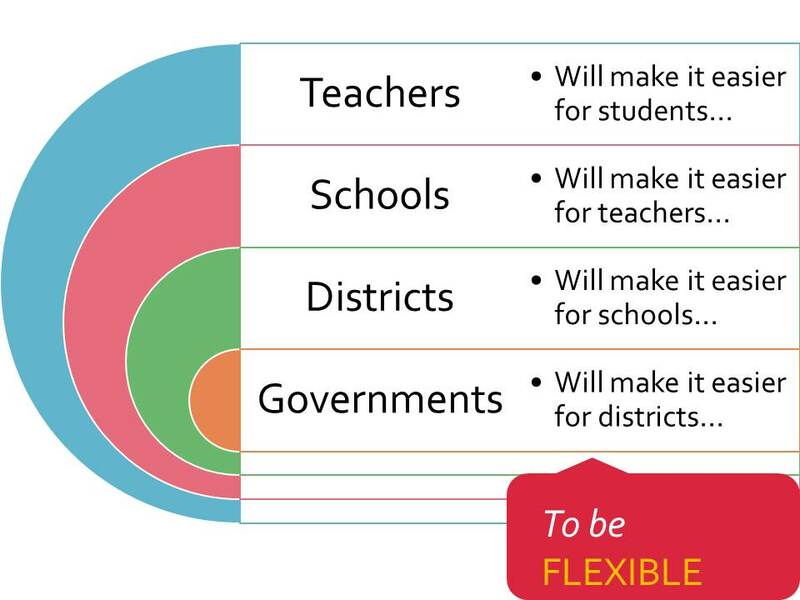 I shared this slide (below) in a recent presentation giving an overview of what I think flexibility means in the education context. Just as we talk about students owning their own learning as an optimal goal, the same is true for adults; the more we own our learning (and teaching), the more optimal and powerful a system we will have. As a leader in a school district, I want all levels of government to grant us the flexibility to allow districts to have their own flavour, or character within a larger framework. In turn, as district leaders, we can do the same for schools in allowing schools their own signature. It is a given, tensions may continue around central or local control, but flexibility and balance should be a consideration here as well. The process repeats itself in schools with principals giving teachers the ability to be flexible, and teachers doing the same for students in giving students choice in the what and the how of their learning. I do often hear, “we just need permission”, and I am not always sure what that means, but it does point to a culture of thoughtful experimentation where those at each level in the system recognize it as part of their role to increase the flexibility, choice and ownership for others in the system. Granted, flexibility is only part of the equation. The commitment of everyone in the system (as it becomes less standardized) is to network — pulling people together to pull together key ideas. Teachers need to network students with similar passions, principals need to assist in networking teachers, district leaders to network schools, and governments to districts. Ideally, governments around the world would network together, because just as it is important that two students network and work together to solve a problem in a Grade 5 social studies class, the same holds true for everyone in the system. We want BC to learn from and with Alberta, Ontario, Australia, Finland and all others who are on this journey to move education forward. Part of my role as district leader is to encourage flexibility, to be a cheerleader for innovation and then to tell the story, weaving together the different journeys in the district as part of a shared narrative. Creating a more flexible system is all the rage right now — who doesn’t favour it? It does need to be more than just letting people do whatever they want to do. It needs to be systemic, across all roles, giving increased choice for others to work within a larger framework, and pulling the different approaches in a network of learning — together. 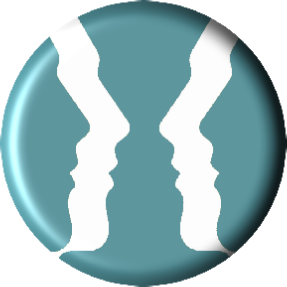 I find it easier to write and talk about a system with less standardization and control than what we currently have, but it will be part of our challenge going forward to allow passions to be pursued, and permission to be given. Hopefully, we are now at the front end of the era of educational flexibility.